After years of helping out farmers and others in distress, Scarlett is finally recognized for her great efforts. She is rewarded with her very own island farm, and though she is super excited, what can she possibly raise on something that has so very little land? Fish and other sea creatures of course! 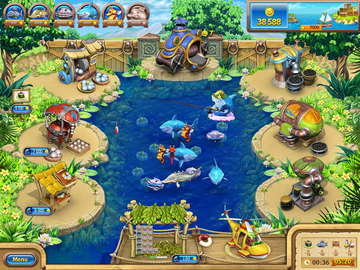 Join Scarlett in 90 all-new underwater ranching challenges to create delicious goods. 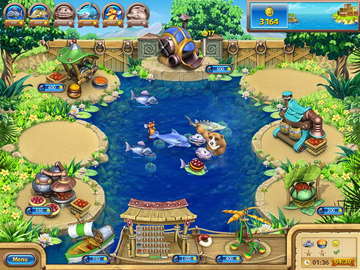 Farm with help from wonderful sea creatures including salmon, seahorses, and dolphins. Upgrade over a dozen new buildings. Make over two dozen new products. Chase bears away with sharks! It's one hilarious escapade. 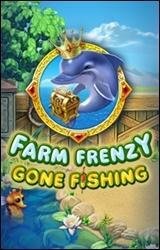 Farm Frenzy is now here for a while, and new releases have become something regular with this game as the game manufactures release new editions of the game in a small time interval between them. This produced in a couple of last editions almost the same games with barely visible differences, not to mention the differences in the gameplay which practically there isn’t any. So what does the FF – Gone Fishing has to show us that is new? Well let’s start with the story of the game. Scarlet, our everlasting hero of the Farm Frenzy series is back again but this time there was no word of anything that connects her with farming and agriculture except a reward which she got from the mentioned area of expertise. When she got her reward she got a bonus as well that goes with that reward, a small island just for her. But what can Scarlet do with an island? Someone would make that Small Island a private tropical paradise, but Scarlet isn’t our average everyday person. Normally she would put some chickens and some cows or goats, but this time there isn’t that much space for all those animals! But as soon Scarlet arrived to the island, there was no time to waste and she immediately started coming up with a new source of funding for her little island. This time there is no chickens, as frankly laying eggs for chickens in the water isn’t there stronger side… This time underwater creatures are on the list to do different jobs for Scarlet in producing new but oddly familiar products to the ones from the previous releases. Salmon’s are now new chickens, as they lay caviar that strangely gets you nostalgic with the chicken’s eggs. Then you can sell it, or send it into a factory for upgrading, so to speak. You can use caviar to reproduce it in new caviar butter, making it more expensive and so forth until the final product. Sturgeon produce slightly more expensive caviar similar to the goats and the sheep’s, and the most expensive animal here is the dolphin. 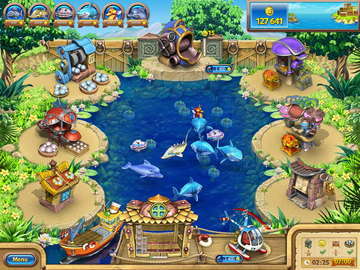 Dolphins use their sensitive noses to dig up treasures for you, from which you can profit a lot. In the place of dogs and cats come sharks and seahorses. Sharks drive out the insanely stubborn bear, which still doesn’t give up in messing up your plans. The Seahorses are there to collect any goods left standing, just like a cat. As for the rest of the game it is pretty much the same, The upgrade shop is still where it was, and you upgrade your factories there, your bear cages, helicopter, but this time you upgrade your boat for transportation of the goods that are going to be sold. But those upgrades as always don’t come just like that. Plenty level need to be finished to be able to unlock all of the upgrades that are available or you do a lot of repeating of the levels you have already finished. Besides the great new theme in the game, another thing that every player that played FF before will notice is the shift in the games difficulty. The games was pretty easy on the beginning levels and in some levels it could get tough in the past releases, but now the game can get really hard. The game will time the right moment for you to get busy as hell, with all the clicking of different products conversion into more valuable ones, and when that happens the game will get you so worked up that your clicking finger might get too worked up, especially when the bear start pouring in. To wrap it up, we got a game with about 90 levels to get through each easily finished, but with what time? Silver time is now hard on its own, but the gold presents a real challenge for any fan of the game and will make you work your way through if you are planning to finish the game. The new exotic underwater theme brings new life and for that matter new hope for this game, as the developers started to realize that a good recipe can’t work again, again and again. Things got to change and bring variety into every new release and even though the game still sounds familiar when you look harder it’s a start. Fans who loved the game but gave up on it because of the repetition may found this release to be a window to a new series of Farm Frenzy which might start surprising us in more ways than just some serious theme change.